Career interviewer Chandler turns the klieg lights on the Master of Suspense and his collaborators, with highly repetitive results. Alfred Hitchcock (1899–1980) was inarguably one of the greatest raconteurs in his field, a director whose bag of tricks and tales seemed to weigh even more than his bag of bones. He’d probably be a perfect subject for Chandler (Nobody’s Perfect: Billy Wilder—A Personal Biography, 2002, etc. ), whose method is to talk with every conceivable survivor who’s ever worked with her subject—if only most of them, like Hitchcock himself, hadn’t talked so often and so freely before. 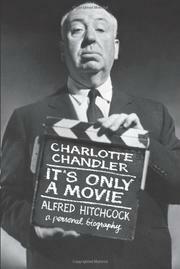 Chandler begins with an introduction in which the Master himself recounts a series of anecdotes and bromides that he seems to have recycled entirely from sources like François Truffaut’s Hitchcock (1966) and Sidney Gottlieb’s Hitchcock on Hitchcock (1995). There follows a chronological account of the making of each of Hitchcock’s 53 films, complete with summaries and properly deferential reminiscences from cast, crew and acquaintances. (Tippi Hedren’s daughter, Melanie Griffith, is a notable and welcome exception.) Chandler has dug up collaborators from as far back as The Farmer’s Wife (1928) and Blackmail (1929), and the story that emerges, largely in the voices of Michael Redgrave, Joan Fontaine, Laurence Olivier, Grace Kelly, Bernard Herrmann, Anthony Shaffer and their distinguished ilk, is consistently entertaining. What’s missing is greater selectivity—Chandler dutifully summarizes even the most unrevealing interviews—and the originality that would have set this volume apart from the 80 books on Hitchcock that have already appeared, especially from Patrick McGilligan’s magisterial 2003 biography. Persevering readers, however, will learn new details about the Statue of Liberty climax to Saboteur (1942), and learn as well that Hitchcock’s favorite painter was Paul Klee and that the director was bothered throughout his life by his physical unattractiveness. A good introduction to Hitchcock’s life and work that doesn’t stand out in a crowded field.